The Chinese Buddhist Canon refers to the total body of Buddhist literature deemed canonical in Chinese, Japanese, Korean and Vietnamese Buddhism. The traditional term for the canon (traditional Chinese: 大藏經; simplified Chinese: 大藏经; pinyin: Dàzàngjīng; Japanese: 大蔵経; rōmaji: Daizōkyō; Korean: 대장경; romaja: Daejanggyeong; Vietnamese: Đại tạng kinh)." One of the most used version is Taishō Shinshū Daizōkyō (Taishō Tripiṭaka, 大正新脩大藏經). Named after the Taishō era, a modern standardized edition originally published in Tokyo between 1924 and 1934 in 100 volumes. It is also one of the most completely punctuated tripitaka. The Xuzangjing (卍續藏) version, which is a supplement of another version of the canon, is often used as a supplement for Buddhist texts not collected in the Taishō Tripiṭaka. The Jiaxing Tripitaka is a supplement for Ming dynasty and Qing dynasty Buddhist texts not collected, and a Dazangjing Bu Bian (大藏經補編) published in 1986 are supplements of them. ^ Han, Yongun; Yi, Yeongjae; Gwon, Sangro (2017). Tracts on the Modern Reformation of Korean Buddhism. Jogye Order of Korean Buddhism (published September 20, 2017). ^ Storch, Tanya (2014). The History of Chinese Buddhist Bibliography: Censorship and Transformation. Cambria Press (published March 25, 2014). ^ Centre, UNESCO World Heritage. 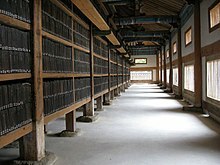 "Haeinsa Temple Janggyeong Panjeon, the Depositories for the Tripitaka Koreana Woodblocks" (PDF). whc.unesco.org. ^ "A Research on the Authenticity of the Bhikhuni Seng Fa from Jiangmi 關於江泌女子僧法誦出經" (PDF). ^ "zz关于伪经 - 饮水思源". bbs.sjtu.edu.cn. (in Chinese) CBETA Project (with original text of Taishō Tripitaka vol.1-55, 85; the complete Zokuzokyo/Xuzangjing, and the Jiaxing Tripitaka). This page was last edited on 17 April 2019, at 17:16 (UTC).